Seine Musik ist wie eine Offenbarung. Als gefeierter Musiker der Jazzszene Großbritanniens, lässt er nun auch verstärkt Deutschland in den Genuss seiner Kunst kommen. Mit „The Tide Has Changed“ begibt sich Gilad Atzmon & The Orient House Ensemble auf ein Bebop Terrain voller spannender Momente. Geprägt von nahöstlichen Klängen, schwebt die Musik in einem Dialog voller explosiver Augenblicke unaufhaltsam durch Raum und Zeit. Turbulent! 1963 wurde Gilad Atzmon in Jerusalem geboren. Im Jahre 2000 gründete der Holzblasinstrumentenmusiker die Formation The Orient House Ensemble. Nun gilt es in 2011 ein 10jähriges Jubiläum zu feiern. Zu diesem Anlass veröffentlicht das Quartett eine aufregende Produktion „The Tide Has Changed“. Eine ganz besonders ergreifende Mischung von Kultur und Tradition. Die knalligen Improvisationen versprühen Charme und leben vom schrägen Humor des Bandleaders. Im Dialog der Verspieltheiten – Bebop trifft auf nahöstliche Klänge. Prägend dabei vor allen Dingen das raffinierte und eindringliche Spiel Gilad Atzmon. Der Multiinstrumentalist – er agiert an diversen Saxophonen, an Klarinette, Sol, Zurna und an Flöten – brennt vor Energie und verströmt unbändige Spannung. Brillanz, Leidenschaft, Intensität und Wärme – das ist „The Tide Has Changed“. 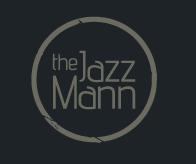 Zeitgenössischer Jazz in unterschiedlichen musikalischen Stilen zelebriert und verpackt. Empfehlenswert! Line Up: Gilad Atzmon (Multiinstrumentalist), Frank Harrison (Piano, Xylophon), Yaron Stavi (Bass), Eddi Hick (Drums). His music is a revelation. As a celebrated musicians of the jazz scene in Britain, it can now also used increasingly in Germany to enjoy his art. With "The Tide Has Changed" goes to Gilad Atzmon & The Orient House Ensemble on a terrain full of exciting moments Bebop. Influenced by Middle Eastern sounds of floats, the music in a dialogue of explosive moments inexorably through space and time. Turbulent! 1963 Gilad Atzmon was born in Jerusalem. In 2000 founded the woodwind musicians group The Orient House Ensemble. Now it is in 2011 a 10th anniversary celebration. At this event, the quartet is an exciting production of "The Tide Has Changed". A particularly poignant mix of culture and tradition. 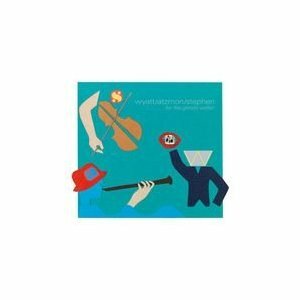 The bright improvisations exude charm and live off the quirky humor of the band leader. In the dialogue of playfulness - Bebop meets Middle Eastern sounds. 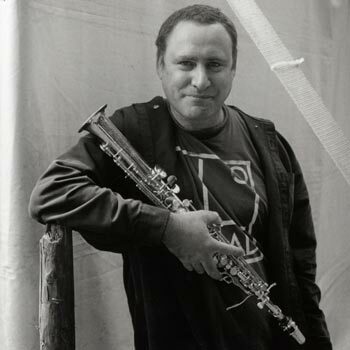 Influential here, above all, the refined and haunting play Gilad Atzmon. The multi-instrumentalist - he acts on various saxophones, clarinets, sol, zurna and flute - is burning with energy and exudes unbridled power. Brilliance, passion, intensity and heat - this is "The Tide Has Changed". Contemporary Jazz celebrated in different musical styles and packaged. Recommended! Line Up: Gilad Atzmon (multi-instrumentalist), Frank Harrison (piano, xylophone), Yaron Stavi (bass), Eddie Hicks (drums). Seine Saxofon-Soli sind von Charlie-Parker-hafter Intensität und zeigen einmal mehr, was für ein Super-Jazzer der Musiker ist, den viele vor allem als Politaktivisten kennen. Atzmon nennt sein Quartett nach dem Jerusalemer Hauptquartier von Arafats P.L.O. The Orient House Ensemble und ergreift auch als Schriftsteller Partei für die Palästinenser. In seiner Musik verbindet der nach England emigrierte Israeli orientalische und westliche Klänge. Atzmons Agitation geht unter die Haut! His saxophone solos of Charlie Parker-like intensity and shows once again what a super jazz musician, whom many know primarily as a political activist. Atzmon calls his quartet to the Jerusalem headquarters of Arafat's PLO The Orient House Ensemble, and also as a writer takes sides with the Palestinians. His music combines the Israeli who emigrated to England Eastern and Western sounds. Atzmon agitation gets under your skin! 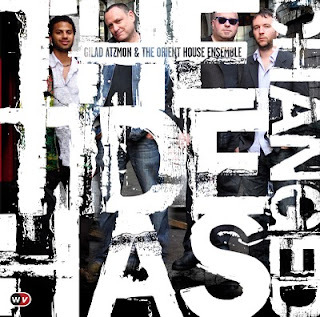 The Tide Has Changed is the sixth album of the Orient House Ensemble, led by the Israeli altoist Gilad Atzmon, formed a decade ago and named in honour of the headquarters of the Palestinian people in Jerusalem. "Ten years ago I realised that beauty is the way forward", Atzmon writes in his sleeve notes. And listening to his solo work on the title song after the hokum of the introductory track, you recognise too how the sheer beauty of his sounds - a unique amalgam of Hebraic, Arabic and jazz traditions - has gained authority, sonic unity and huge emotional depth during those years. The quartet has a new drummer - Eddie Hick - with the ever-inventive Frank Harrison on piano and the pulse of Yaron Stavi on bass. Hick's rattling snares open And So Have We with Atzmon's clarinet, an expression of the Atzmon dictum that "the melody is the truth". The Orient House Ensemble, named with Gilad Atzmon’s usual challenging flair, after the Palestinian people’s headquarters in Jerusalem, is ten years old. The only other original member of the band is pianist Frank Harrison, but the band’s music – a winningly compulsive mix of the Middle Eastern and jazz influences – has remained consistent from the start. Consistent, but constantly developing and becoming more finely interwoven. Listen to the 11-minute title track of this disc and those elements are there, the Middle Eastern ones especially in Atzmon’s saxophone articulation with its microtonal phrasing, but its just so cohesive now. And is there a saxophonist working in the UK today, or a band in fact, that is able quite to work up this kind of intensity? But there is also such acute attention to the gorgeousness of the sounds. As Atzmon adds that growl, and launches into those lightning runs, followed by high, held screams at the top of his instrument, Harrison, bassist Yaron Stavi and drummer Eddie Hick churning beneath, so are added rich, held chords of Tali Atzmon’s voice. And then we are back down to a funky bass and drums for Harrison to start building up the tension all over again. There are heaps more joyous moments like this on this album, including a great version of Ravel’s Bolero, or Bolero At Sunrise as he calls it, Atzmon bringing a fresh lyricism to this most familiar of melodies against a lovely, sinuous groove. And So Have We shows Atzmon’s rich tone on soprano, while London To Gaza features the multi-layered pleasures on its melodic statement of Atzmon’s saxophone line shadowed by his own accordion with Stavi’s bowed bass underneath, before it morphs into a measured and Coltraneish slow-burner, Atzmon again stressing that Middle Eastern saxophone tone and articulation. It’s a saxophonic tour de force. And of course, humour is never far away from the seriousness – from the MC-led opening to the oompah madness of We Laugh. This was a great way to herald in the new era at The Edge. This concert was the first in the newly constructed building at the thriving Edge Arts Centre in Much Wenlock. First impressions of the new hall were highly favourable, particularly with regard to the acoustics. Atzmon and his fellow musicians sounded excellent throughout. 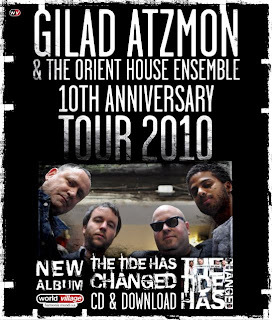 The London based Israeli musician Gilad Atzmon is celebrating the tenth anniversary of his regular working band the Orient House Ensemble and is currently in the middle of a huge nationwide tour in support of the quartet’s latest album “The Tide Has Changed”. The tour is sprinkled with dates featuring an expanded line up with the OHE joining forces with the members of the Sigamos String Quartet who had worked with Atzmon on his previous album “In Loving Memory Of America”, a project inspired by the “Bird With Strings” recordings of the great Charlie Parker. This evenings performance included material drawn both from the “with strings” project and from the OHE’s regular repertoire. The evening began with the four members of the OHE taking to the stage to perform the title track of their new album. Joining Atzmon on saxophones and clarinet were original OHE member Frank Harrison on piano, long serving double bassist Yaron Stavi and the OHE’s latest recruit, drummer Eddie Hick. “The Tide Has Changed” proved to be a stunning opener, a classic example of the group’s unique blend of Middle Eastern musical motifs and jazz improvising, this time with the band’s wordless vocalising adding to an already heady mix. Atzmon and Harrison delivered dazzling solos on alto sax and piano respectively with powerful yet intelligent support coming from a highly flexible rhythm section. Hick has stepped admirably into the void left by the departure of former drummer Asaf Sirkis and the two performances I’ve seen him give with the OHE confirm his growing reputation as one of the UK’s most exciting young musicians. All that gigging helps account for the collective energy of the band... and this is jazzy, freaky, potent stuff. Happy birthday to the Orient House for a decade on the jazz block: and what better way to celebrate than ith thi l d with this splendid, ever changing album. We kick off with Hussey’s circus bark (he’s the Blockheads vocals man) calling us to the party in a mix of Kurt Weill, Sgt Pepper and, um, David Essex. But being the OHE, of course, we walk through the door to the sound of scuffed piano strings and Atzmon’s lamenting ululations. The world’s realities march alongside the good times with this band. However, beauty always beats the bad guys, and a stirring vamp held down by a seismic bass figure soon has the spirits rising on the anthemic title track. Compared to the likes of Exile, this OHE production uses fewer colours, fewer guests: this is very much a quartet album, deeply focused and with all frills edited out. This is a band that after a decade is as tight as the proverbial drum; and talking of which, the promising Hick slots in admirably, less spectacular than Sirkis, but that complements this disciplined, even inward-looking project. Other stand-outs include a restrained take on Ravel’s ‘Bolero’. Much of the ‘exoticness’ is leeched out, allowing direct access to that seductive theme which gyres and gambols around us. If Atzmon flourished in Parker mode with In Loving Memory Of America, then Coltrane is the touchstone here, notably on the long meditation ‘London To Gaza’ which features a lyric solo from Harrison whom, need we say, grows leaner, more sparing yet more killing with every recording. We end in party mood, of course, with a Balkan knees up, though the Weill coda reminds us of tears behind the laughter. But for now, let’s raise a glass: to the next decade. The set started with a Gilad announcing that they were going to play their new album, ‘The tide has changed’, and commenced with the opening track ‘Dry fear’, warming up the crowd with his serpent charmer spell. The next track required a change of instrument, and for this one Gilad chose his saxophone. He quickly realized that he had left his sax strap up in his hotel room and asked whether someone would retrieve his strap, as he could not play without it. This accident allowed him to improvise and free associate with words. With the strap recovered, a cheer went up from the crowd and the set kicked off with the title track – ‘the tide has changed’ – intense, frenzied and original. The thing that quickly becomes glaringly obvious is the Gilad Atzmon is a chameleon, many different elements in a glorious synergy. What distinguishes Gilad Atzmon from other musicians, aside from his prodigious talent and wicked sense of humour, is his outspoken political opinions. Most other musicians are much more tight lipped, they argue it’s all about the music, and in doing so reveal their blinkered self-censoring approach. The content of their music quite simple & safe. No politics, religion or controversy. Gilad does not restrict himself in any such manner, and here one sees his Blockhead punk roots. That is what makes him so thrilling and exciting. In a world where musicians are safe, traditional, conventional, he is provocative, surreal and challenging. He says what others are too afraid to say, for fear of upsetting their careers, standing and reputation. Most activists stand around with a megaphone shouting angrily about this or that, but not offering any solutions. But Gilad is not angry, quite the opposite. Atzmon is a Jazz activist. He is optimistic and offers solutions to the Israel conundrum. Democracy for Palestinians, Israel should give them the vote, it is the only way that Israel can ensure it’s survival. Israel must cease to be an apartheid regime and integrate with the Palestinians. He dances about with his various voodoo horns, in-between sarcastically mocking the madness of this world. Creating fantasies and fictions here and there, with much wry amusement. 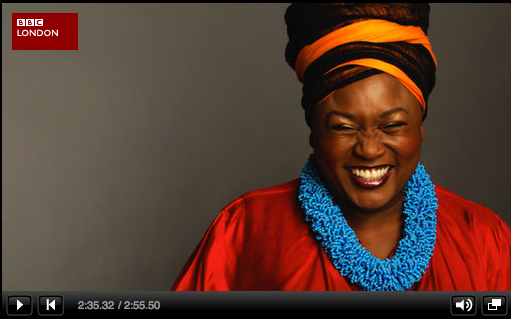 Then back to exploring the higher dimensions of Jazz….the music always so unexpected and joyously random. Ethnic rhythms & eastern scales in a free jazz synthesis. Suddenly one of the band would pull a tune in a new unexpected way and rest would quickly adapt. 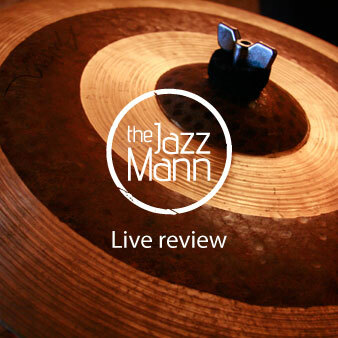 I must single Eddie Hick out for ‘high’ praise, he dazzled with his drumming and nearly eclipsed Gilad several times, wonderful gob-smacking snare work, bewildering percussion and improvisation. It is wonderful to see people at the top of their game, and this is the best the OHE have achieved so far, amazing virtuosity, musicality and range of emotions. Pushing Jazz to the limits and beyond – Peak Experiences Allow Consciousness Expansion. PEACE. not to be missed. The album concludes with "We Laugh" - a concluding counterpart to the album's first piece, another cabaret like piece, and a suiting conclusion of the exuberance of "All the Way to Montenegro". But unlike the rigid politicking of politicians and increasingly Machiavellian style of today’s political essayists, the band’s latest work is also unapologetically humanistic. Those familiar with the writings of Gilad Atzmon—the famed ex-Israeli musician and brilliant saxophone player, now based in London – can only imagine that Gaza was the place that occupied his thoughts as he composed The Tide Has Changed. The title track, an 11-minute melody, transmits the host of emotions that engulfed many of us when Israel began mercilessly pounding the resilient and hostage Gaza Strip in late 2008. First there were the simultaneous strikes which killed hundreds. Some of us woke up to watch the dreadful images of poor police cadets in Gaza reeling under the ceaseless bombardment in a heap of human flesh. Body parts of young men and their families scattered across burning buildings and pulverized concrete. Those still alive were hauling whatever remained of their bodies across the sea of the dead, mostly in their graduation uniforms. It was a moment of disbelief, of questioning much of what we’d previously held to be true. It came as a shock and awe to our collective consciousness, and was further bolstered by endless days of constant shelling and tragedy. And the tide began to change as if the moment of death, of release, was the very moment of liberation. Gaza’s thousands of victims may have produced the nudge for millions around the globe to begin to finally confront their inner fear, their subtle sense of shame for allowing a tragedy of that magnitude to continue for all these years. As Gaza held strong proving once and for all that unspoken values – human spirit, the will of the people, the collective dignity of a nation – was stronger than all that military genius can possibly generate, millions went to the streets in a most disorganized, chaotic and yet genuine expression of human solidarity witnessed in many years. The tide changed, then, and continues to change. The frenzied and disorganised, yet real sentiments have become an unwavering and well-articulated commitment to justice. The shift cannot always be validated by numbers or demonstrated in charts, but is nonetheless felt widely. Israeli researchers refer to it as the global movement aimed at delegitimising their country. They are labouring to link it to anti-Semitism somehow, but to no avail. Palestinians and their friends vary in their own reading of what happened during and after those fateful days, but contend it was Israel’s murderous acts that incepted and cemented the process of its own de-legitimization. Gilad Atzmon & The Orient House Ensemble articulate it in music - melancholic at the start, but upbeat and unwavering later on. And So Have We, another track, starts with the soft cries of Gilad’s saxophone, accompanied by the sound of drumbeat, and haunting vocals is a sad procession. It invokes the sounds and feelings of the Freedom Flotilla, laden with people from around the world united by a mute sense of powerlessness, then emancipation. When the hundreds of activists set sail abroad the Mavi Marmara and the other ships, they freed themselves and the rest of us from the stifling weight of inaction in the face of injustice. It lifted for a moment the huge burden on our collective conscience. It showed civil society at its best, its most humane members sailing and braving the high seas to extend a lifeline to Palestine, to Gaza, which had been left undefended, hungry and alone—but never defeated. It really takes a bit of imagination. We have been forced to believe that the world is now divided between civilizations that are willing to fight and kill to impose their collective will on the rest of us. That we had no other option but to join that clash of civilizations or to perish. That ‘our way of life’ – whomever we might be – is now being challenged and threatened. That conflict is hardly based on class analysis, gender, racial or any other classification, but is a clash between religion-inspired collectives. After 10 years in Britain, Gilad Atzmon is mellowing. The dissident Israeli saxman and ex-soldier who named his group after Palestine's Jerusalem HQ conveys more harmony than protest here. Soulful soprano-sax rules. On London to Gaza, new drummer Eddie Hick spurs Frank Harrison's piano to Keith Jarrett-like heights and Atzmon to clarinet and accordion, although his mission statement — “the melody is the truth, humanism is a metaphor, consciousness is the devil and amnesia is freedom. The tide has changed and so have we” — defies morning-after analysis. “The Tide Has Changed” is as good as anything the OHE have produced in their ten year history. 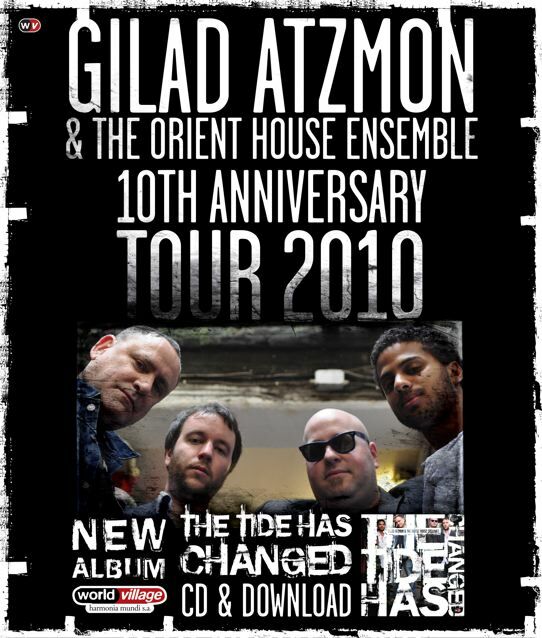 Gilad Atzmon's virtuosity, eclecticism, showmanship and ironically delivered politics are currently devoted to the 10th anniversary of his Orient House Ensemble: there's a 40-date tour and a new album. A shrewd pacer of live shows, Atzmon steered tonight's performance from ambiguous, unsettling microtonal and geographical drifts between the west and the Middle East, toward an optimistic, conventionally tempered finale on Wonderful World, pulled off without a hint of cheesiness. Atzmon displayed his quavering, pitch-warping sound on the opening of the album's title track, The Tide Has Changed. But he soon cranked up the theme's staccato hook, then sprinted into flying double-time bop. Most of the other improv diversions came from pianist Frank Harrison – who, like his boss, favours deceptively oblique buildups to what become emphatic sermons – though bassist Yaron Stavi and new drummer Eddie Hick were the ensemble's steadily pulsing and sometimes roaring engine. Atzmon played his mischievously sentimental soprano account of Ravel's Bolero before once again twisting the pitching to give it a pensive, discomfiting feel. London to Gaza was a melancholy ballad over bowed bass that became a flat-out group wail. A theme reminiscent of It Ain't Necessarily So turned into Roll Out the Barrel, and then into Mack the Knife, before a chattering Indo-bop vocal improvisation threw Salt Peanuts in for good measure. At the close, the leader turned to pure-toned baroque clarinet, veering into an east European folk-dance feel, and for an encore paid tribute "to our favourite Palestinian singer – Louis Armstrong". He announced that his heartfelt account of Armstrong's most famous hit proves to him "that despite Bush, and Blair and all those people, we believe it can still be a wonderful world". Even before the end of the sold-out First House, a substantial queue was already forming for the Second House outside Ronnie Scott's. Soon after 10pm, the First House crowd started emerging, many clutching OHE CDs, a good mix of young and old, all evidently having had a highly enjoyable evening. Some enthused in glowing terms about the performance to friends waiting in the queue. But such scenes have become a commonplace at gigs featuring the incredible Gilad Atzmon & The Orient House Ensemble. Comes with 70% discount. Enoughsaid. Let's eat. Groupon. UK’s No.1 Equity Release SpecialistSee How Much You Can Release Today. Try GFTs Award-Winning TradingPlatform. Free Practice Account. With an artist as fecund as Atzmon you learn that some you win, some you lose. Following the excellent In Loving Memory of America (and preceding a new collaboration with Robert Wyatt), this celebration of his band's 10th birthday returns to familiar Middle Eastern modes and lugubrious sax solos. It also rather uncomfortably mixes the genuinely sublime (sad ballads such as "And So Have We", "We Lament") with the ridiculous, most notably in the Shuttleworth-meets-Brecht vibe of the opener and closer.